Trail marker near the top of a mountain that took forever to climb. Most people seem to know that I tend to get lost. I’m not going to blame Google maps, but I refuse to be the bigger person and say that it’s all my fault. Anyone can miss a turn and wind up alone on streets that are probably owned by Mexican drug lords or find themselves driving backwards into a Drive-Thru. Life happens. And when it happens to me I have always called my Dad. It’s like the first thing I do. But long-distance calls from Prague are expensive, I’m told. So I have been doing a lot of getting lost and staying lost for a very long time. There’s basically no feeling worse in the entire world, I promise. 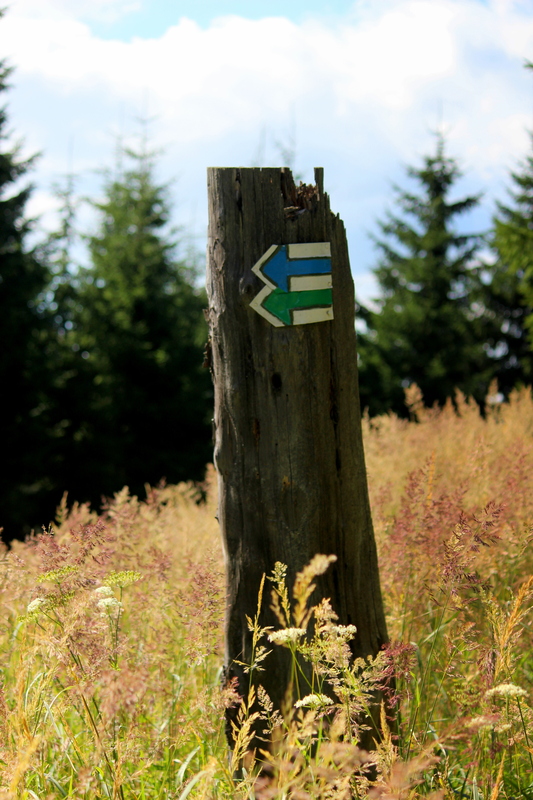 But while Prague’s antiquated street signs could be a little less confusing, hiking trails in the Czech Republic are amazing. There is an intricate pattern of routes through mountains, meadows and little villages that all look like the one in the opening scene of Beauty and the Beast. Each path is marked by a different color and each color is painted in between two white stripes on trees or rocks or other very obvious markers. Follow the colors, find your way home. Very easy. And yet, even with these very direct trail markers, we get lost. 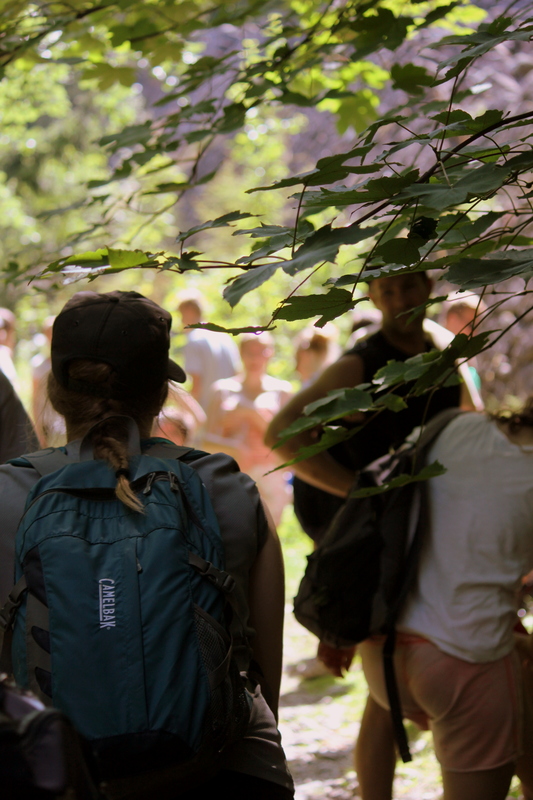 This last week the American team met with a number of young Czechs to go hiking through Jeseník. Five days of intense and not-so-intense-but-extremely-long-and-aggravating hikes. Between the 37 of us, we got lost enough times to have walked to Prague and back on mistaken paths, bad bridges and whatever that steep, downhill thing was with the bee hive I ran into. Jerry, our fearless leader, reassured as any guide would. We didn’t learn this until the week was mostly finished and so was our physical and emotional stamina. Water stop near a spring where hikers made the choice between hiking thirsty or hiking with bacteria infected water. On Thursday, our team ended up scattered across the countryside. Jerry, myself and the lovely and talented Katka took an unexpected lead in the unofficial race home when we were the only ones to successfully make the switch from the red trail to the blue trail (I will shamelessly take credit for this one – I am very proud of my ability to spot color markings on trees). Twenty two hikers walked 15 minutes in the wrong direction and then waited a half hour before changing courses. Four continued down the same wrong path until they reached a highway. Another trekker had retraced his steps several kilometers back to look for glasses he had left behind at our last rest stop but had failed to make contact with the team member we left behind to guide him home, so both of them had to find their way back to the cabin alone. Several of us were sick, one of us threw up – I won’t say who but it wasn’t me. Thankfully we all made it home in time for dinner and that’s all that really matters. But getting lost in the forest had some benefits. You really get to know people when you think you may be baking the last hours of your life away on a ninety-degree incline leading up a mountain, Death’s jaws waiting open and hungry at the top. Most of my best conversations – the ones that go past “How do you say, ‘Sandwich’ in Czech?” – happened after we had crossed the point of exhaustion and surrendered ourselves to following the leader, wherever he may go. Tee dum. The sweltering temperatures did not hinder good discussion and I have found that Czech young people (16-24ish) are exceptionally well-versed in politics, philosophy and social theory (but I am comparing them to the American standard which is unfortunately a lower bar in many respects. God bless America, but it’s true). So we got to talking about some of my favorite topics, like how Biblical standards of morality provide a basis for valuing human life in circumstances like abortion, genocide or euthanasia, or how reason and thinking minds are the greatest proof of the existence of a creator. Eventually our conversation would end as the team would re-mass by a sketchy water source to refill our bottles. (Ever had water from a stone-walled spring encasing a shrine to Holy Mother Mary? Me neither – I don’t want cholera, thanks). But I’m hoping my Czech friends are still thinking about whether God is real and whether he has a plan for their lives. 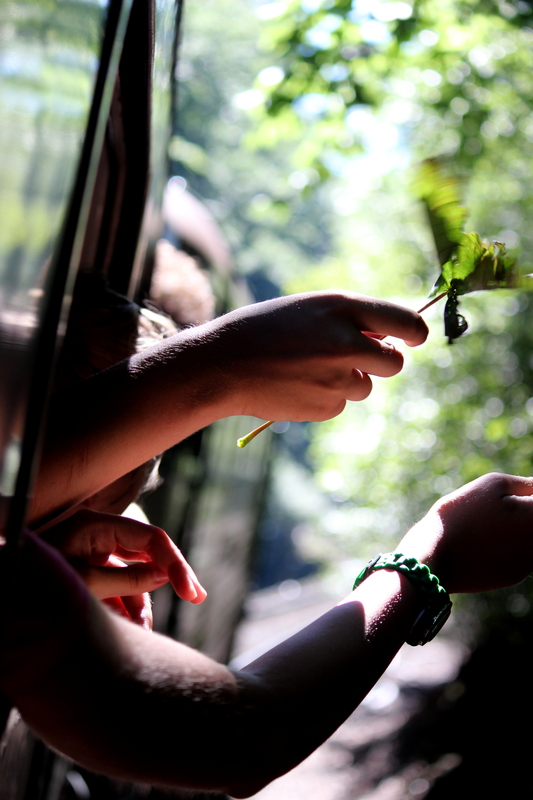 Holding leaves out the windows on the train home. Because not knowing God is a lot like being colorblind in the woods. The signs are everywhere but you won’t be able to find your way unless you have a way to read them. And unless you have a cipher to distinguish the colors. Unless you have a foundation to build on that says, “This is absolutely good and true and this is absolutely wrong and bad,” you will find yourself justifying human atrocities as well as daily sins with the rest of humanity. I know what it feels like to be lost – in the woods and in life. And neither one is very fun. In fact, they’re both pretty horrible. And as much as I wish my Dad was still just a phone call away when I need him to get me out of a pickle (or a parking lot in Hillcrest by that stupid Pharmacy), I know that sharing the truth about my heavenly Father is so much more important. Without Him I am lost, but now I’m found – I was blind, but now I see. This entry was tagged Czech Republic, God, Google Maps, hiking, lost, Prague, trail markers, United States. Bookmark the permalink.